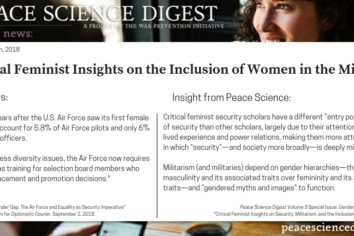 A critical feminist perspective is necessary to a more accurate understanding of problems around gender and militarism, security, warfare, and militaries themselves. All of these depend on gender hierarchies—the privileging of masculinity and its associated traits over femininity and its associated traits—and “gendered myths and images” to function. 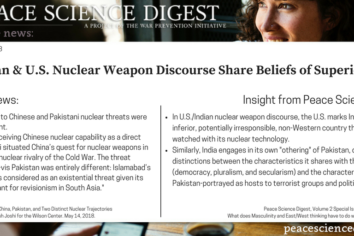 The following analysis is from Volume 3, Issue 3 of the Peace Science Digest. Citation: Saucier, D. A., Webster, R.
Masculinity operates in both U.S. and Indian nuclear weapon discourses--marking their nuclear programs as rational, responsible action engaged in strategic interdependence to meet their economic and political interests, and other programs as inadequate, irrational, or in need of supervision.